California Governor Jerry Brown has been making drone news headlines recently by vetoing a number of drone bills. AB856, a new bill, has finally met with his approval. AB856 changes how we define the physical invasion of privacy. Now the airspace above someone’s land is restricted. This bill, while similar to a another bill Governor Brown vetoed, is designed to criminalize paparazzi using drones to take pictures or video over private property. In the Assembly, this bill passed with a vote of 40–0. Gov. Jerry Brown has signed a bill intended to prevent paparazzi from flying drones over private property. 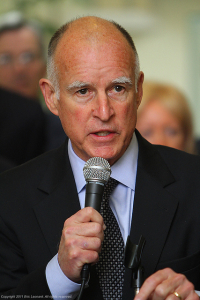 Brown announced Tuesday that he signed AB856, which changes the definition of a physical invasion of privacy to include the airspace above someone’s land in order to capture pictures or recordings. Assemblyman Ian Calderon, a Democrat from Whittier, says trespassing law needed to be clarified because paparazzi use drones to capture celebrities in their private activities. The governor’s support comes after he rejected other limits on drone use. He vetoed a similar proposal last month that would have made flying a drone above someone’s property without permission a trespassing violation.